Origin of Nightwing by Waid and George Pérez! Go more in depth than our top newsmakers in the feature which takes an in depth look at some of the figures shaping the world these 52 weeks. Hello one and all. Here are FanBoyWonder's picks for the last full week of October. Our review of Friday's Battlestar Galactica is coming. Stay tuned.—FBW. One last thing: We really liked the backup origin of Nightwing by Mark Waid and George Perez. We have had much use for these two-page quickie origins until now but at a time where Nightwing has been getting so little respect, Waid's synopsis acknowledges Nightwing to be "the world's greatest acrobat" and a "team leader without equal, a trait not even his famed mentor [The Batman] shares." Yes! Busy, busy, busy this week, made no less so by the talents of Mark Waid and the gorgeous artwork of George Perez as they bring us the origin of Nightwing. * Black Marvel Family, huh? Guess the writers didn't like the Addams Family jokes floating around. * Wow. The Nightwing origin gave us more information than the first six months of the Nightwing comic OYL did at all. Thank God for Marv Wolfman. * I like Tigress. So sue me. * Ah, Ralph, what madness you bring upon yourself. 52 #25 (DC Comics) This issue of DC’s weekly series, like last week’s, is exactly what you would expect a book about the DC Universe as a whole to be like, and, as a fan of that fictional shared setting, it’s everything I could ask for from such a series. 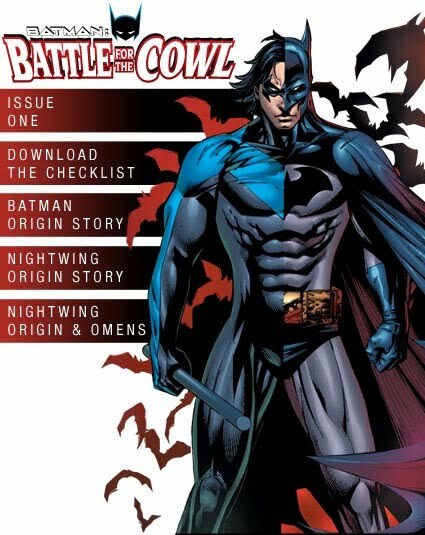 Back-up origin is Nightwing by George Perez; nicely drawn, but missing a lot of info, and way too focused on ‘wing’s crazy present rather than his past or future. - Bruno Manheim, notorious gangster, wants to found a new world order based on crime. When Mirage questions Manheim's ideas, Manheim crushes Mirage's skull into the Book of Crime. He then proceeds to a boardroom full of villains, half of which are dead for whatever reasons. It's there Manheim claims Gotham as his own. Even with buzz words like ward and squire, Mark Waid nails this origin on the head while tossing in a quick sound bite for recent Crisis fallout tales. But story or no, who doesn't love to see George Perez art? This week we wanted to do a special "trick or treat" Halloween cover. It was [former 52 editor] Steve Wacker's idea to have the kid in the middle collecting candy in the Dr. Fate helmet. Actually, this whole cover was Steve Wacker. He called me up and was all excited. He says, "Dude, I already know what we're doing on Halloween." This was way back in the early summer. I did this one out of sequence because I already knew what we wanted to do. I really enjoyed doing this cover. It has an innocence that most of the other covers I have done for the 52 series lack. We caught up with 52 Editor Michael Siglain for some tips and hints about the stuff you may have missed. Down below: on the left would be Week 24, page 10, and on the right – that's Week 25... awwwwwww. At DC, Wacker edited several titles, including the weekly 52, Jonah Hex, JSA and Legion of Super-Heroes. Newsarama: Joe, first off - can you confirm that Steve Wacker is coming to Marvel? Joe Quesada: Yes, I can now officially confirm that this is the case. NRAMA: What does he bring to the table, editorially? JQ: We have the finest editors in comics and Steve just makes us that much stronger as a team. Steve is one of the brightest young editors in the biz and we felt that he would fit right at home here at Marvel. I've just listened to the DC Podcast for 52 and Mark Waid mentioned George Pérez. Also, importantly, that the backup origin story are only two pages. On a side note, Grant Morrison does a wonderful impression of Mark Renton's scottish rant from Trainspotting. 52_, a weekly series set in real time, combines the brightest and best talents from the comic book writing field: The super-heroic stylings of Geoff Johns, Grant Morrison’s kinetic imagery, the noir edge of Greg Rucka and smooth characterization of longtime DC writer Mark Waid. Together – a rock n’ roll comic book super group laying down tracks for a classic album – the writers have given birth to a world previously unseen by comic readers. A world much like our own, covering the entire social spectrum to include race relations, religion and superhuman conflict. What more could readers want? Simple. More story. More art. More revelations. Starting with #12, 52 co-writer Mark Waid will begin painting a picture of New Earth’s history in the form of two-page origin stories featuring some of DC’s key characters, including Wonder Woman and Power Girl by Adam Hughes, Elongated Man and Adam Strange by Kevin Nowlan, Black Adam by JG Jones, and Animal Man and the Joker by Brian Bolland. Other artists slated to contribute to the weekly installments include: Eric Powell, George Perez, Dan Jurgens, Joe Bennett, Dale Eaglesham, Ivan Reis and Jerry Ordway, with many more to come. The months just fly by, don't they? 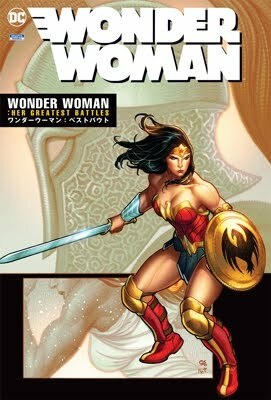 In anticipation of Monday, July 17th's release of DC's full October 2006 solicitations (at 5pm EST), here is your monthly weekend preview of that month's issues of 52, along with (as usual) some other DC titles that look intriguing. The story of the year continues in four more chapters of America's only weekly super-hero adventure! WEEK 22: “Good news, sir. Your son Kon-El didn’t die in the Crisis after all.” Plus, the Origin of Green Lantern by Waid and Ivan Reis & Marc Campos. WEEK 23: “Look what these monsters did to your brother, Isis! They deserve a slow death! Plucked apart like the insects they are!” Plus, the Origin of Wildcat by Waid and Jerry Ordway. Plus, the Origin of Booster Gold by Waid and Dan Jurgens. Plus, the Origin of Nightwing by Waid and George Pérez! 52: A year without Superman; a year without Batman; a year without Wonder Woman…but not a year without heroes. When asked about what artists they would like to see working on 52, the audience offered up an eclectic group including many Marvel exclusive artists. "Who said Jim Lee?" asked DiDio. "That's great. Issue #74." "A lot of artists are now trying to get a week," said Rucka. "There are some of them that have surprised me because I'm like, 'You have a great big name. Why would you?'" Artists that will be working on the back-up stories in future issues of 52 include Eric Powell, Brian Bolland, Kevin Nowland, Adam Hughes and George Perez. CHARLOTTE, N.C. -- Jann Jones, assistant editor of the weekly 52 series, told the crowd at DC Comics' 52 panel at Heroes Con on Saturday that an impressive list of artists has been lined up for back-up features. Among those contributing will be Eric Powell, Brian Bolland, Adam Hughes, George Perez, Kevin Nowlan and Jones' husband, 52 cover artist J.G. Jones. As far as interiors go, DC's Dan DiDio said that having Keith Giffen doing breakdowns gives 52 a consistent look, despite whomever is penciling. "He can take so much information and put it out in a cohesive manner," DiDio said, noting that he didn't want a "jarring" issue-to-issue approach to the book despite the several pencilers. "I've been watching the art come in and we're not compromising anything to get this out on a weekly basis," Jann Jones added.